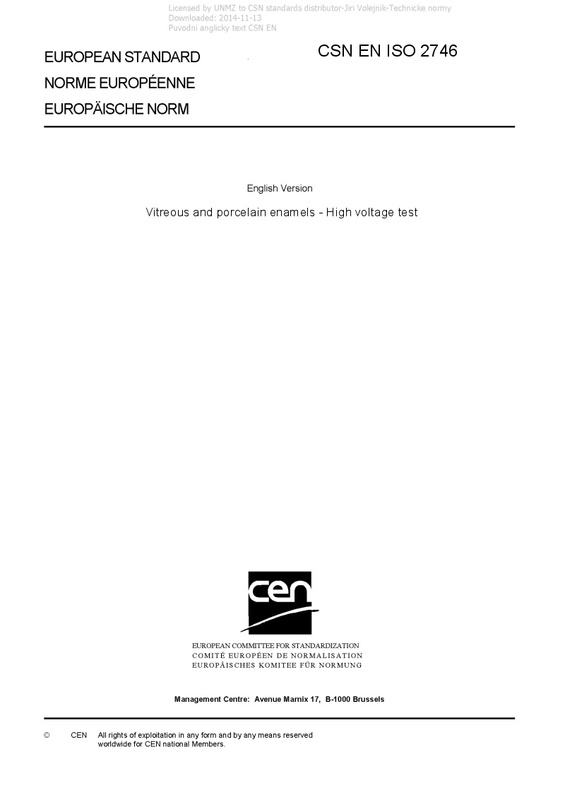 EN ISO 2746 Vitreous and porcelain enamels - High voltage test - ISO 2746:2015 describes two test methods of high voltage testing: - Test A is used to detect and locate defects in vitreous and porcelain enamels; - Test B is used to detect and locate defects and weak spots in vitreous and porcelain enamels. The tests are performed using DC or pulsed DC high voltage. The tests are applicable to dry surfaces of enamel coatings. In the case of moist surfaces, care should be taken to ensure that the locating of any defects is correctly performed. Since test voltages depend on the coating thickness, the test method, especially with test A, may not be suitable for test specimens for which the coating thickness varies to a large extent.